There has never been an easier way to protect your critical electronics. Faraday EMP Bags are designed to protect against damaging Electromagnetic Pulse currents. 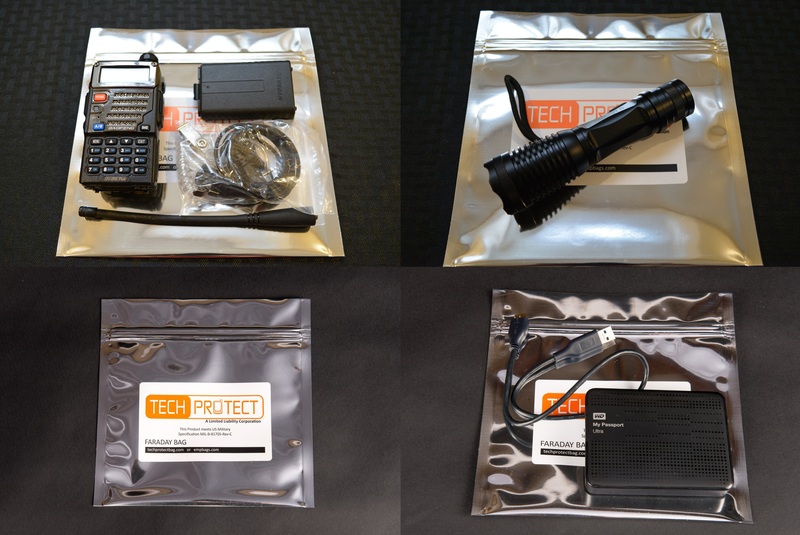 One cannot predict the size, strength, or proximity of an EMP, but by using Tech Protect Faraday bags, electronics will be protected from the harmful gamma radiation and electrical current that kills electronics. What Does an EMP Destroy? There is a lot of misconception when it comes to what an EMP will actually kill. The bare roots of it is anything that has a microchip, is plugged into the grid, or both. Many people don’t understand that something as simple as an LED flashlight (basically the only kind of flashlight that can be found now) would no longer work after an EMP. LED is an acronym for “Light Emitting Diode.” Since LEDs are microchips in and of themselves they would not survive an EMP. Also simple items such as blenders and refrigerators that often do not have microchips in them will stop working after an EMP or Solar Flare because they are plugged in/connected to the grid. Anything plugged into a wall outlet in the house is susceptible to an EMP or Solar Flare. If the blender, without a microchip, were not plugged in when an EMP or Solar Flare went off, then the likelihood of it surviving the event is extremely high. Solar Generators, Electric Start Generators, Vehicle Computers, HAM Radios, LED Flashlights, AM/FM Radios, Power Tools, Sewing Machines, Power Inverters, Solar Panel Diodes, Electronic Water Pumps, Battery Chargers, Clocks/Watches, LED/CFL Light Bulbs, Cell phones, Laptops, Walkie-Talkies, Hard Drives, USB Drives, GPS, Electronic Starters, Medical Devices, Red Dot Sights, Night Vision & Infrared, Calculators, TVs, Microwaves, Cords with Large Power Adapters, Dehydrators, Wheat Grinders, Blenders, anything else that has a digital component or microchips in it that would be needed or desired after an EMP event. Nesting is when one faraday bag is placed inside of another faraday bag, making two layers. Many people ask why this is necessary? In recent years, Super EMP technology has come around and is able to get through more shielding than a normal EMP bomb. The biggest difference with a Super EMP weapon is that because it reaches through shielding better, there needs to be more shielding to protect against it. One way of doing that would be to make the EMP bags twice as thick. However, when the material used for the EMP bags is made twice as thick, it loses its flexibility and become breakable. The way they are made is to be flexible so that they last years of heavy use without breaking. Rather than make them twice as thick and risk them breaking over time with use, we use two layers of bags which then meets the requirement for EMP protection from a Super EMP attack. This is one of the reasons why there are many different sizes of EMP bags. For example: 2 Small bags will fit inside 1 Medium bag. Also 2 medium bags will fit inside of 1 Large bag. And, 2 Large bags will fit inside of 1 X-Large bag and so on all the way up through the different sizes. How Much Can One EMP Bomb Do? The image above shows the affected areas from an EMP with variations in the height of the detonation of the bomb based on the explosion happening over the middle of the United States. If the EMP bomb goes off 30 miles above the ground, its E1 phase will affect an area about 960 miles wide which is about 1/3 of the USA. 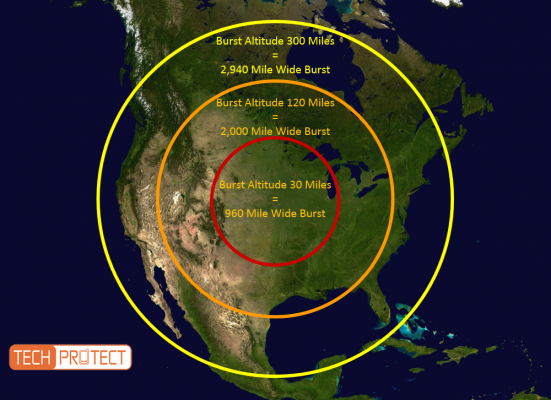 If the altitude of the bomb goes up to 120 miles then the effects of the E1 phase of the EMP spread to 2,000 miles wide, covering over 75% of the USA. But, if the bomb goes off at 300 miles above the earth it covers 100% of the 48 lower states of the USA as well as hitting large parts of Canada and Mexico as well. The closer to the middle of the EMP bomb you are the higher the voltage is that effects your electronics and items connected to the grid. What is an E1 Phase? There are three parts to an EMP, the first phase is called E1. The second and third parts are called E2 and E3. E1 and E3 are considered to be the most dangerous or destructive parts of an EMP bomb. This is why using Faraday EMP bags is such a vital part of protecting items from the radiation. E1 – The time duration of this phase is about 1 – 5 NANOseconds, whew that’s fast! This part is when the bomb goes off, the gamma radiation that is in the bomb actually cascades down like a blanket to the earth. Whiles it’s cascading down it knocks electrons out of the air and they are charged with energy from the bomb. Once that energy reaches electronics, whether they be plugged in, turned off, in pants pockets, on tables, in the air, or wherever, the microchips get short circuited and ruined. This is extremely damaging because microchips must be replaced, they cannot be repaired. The easiest way to protect these electronics from getting ruined is to keep them in a Faraday EMP bag. The energy simply flows around the EMP bag and continues its path to the ground. Grounding is not required for these bags because of the size of the bags. They are small enough that they will not accumulate huge amounts of energy where grounding would be needed. A 20ft metal shipping container on the other hand would absolutely need to be grounded because it would take on so much energy. E2 – This happens directly after the E1 phase. This lasts anywhere from 1 microsecond to 1 second in length. This is the initial energy that surges through the national power grid. The dangerous part of this is that it has the ability to arc, or jump, from one contact to another. As an example, if there is a blender on a counter top that is about 4 inches away from the outlet, but it is not plugged into the outlet, the energy could still hit the blender. Research has shown that the energy can jump about 6 inches. The wiring in a house is connected to the power grid. The energy comes through the grid, into the house, to the outlet, jumps from the outlet to the blender, shorting it out. Back in the 1800’s when the Carrington Event happened, some people reported they saw electricity “dancing” across the floor. Also people reported that items such as telegraph machines were exploding, telegraph wires were catching on fire and that items were short circuiting instantly. There is a concern for fires to happen with this as well. Luckily wires and cables in the United States are better insulated than they were 150+ years ago, that doesn’t mean fires can’t start from this surge of energy. E3 – This is the last big pulse from the EMP blast. This lasts much longer than the other two phases, about 10 seconds to a few minutes. This acts just like a Geomagnetic Storm or Solar Flare. The energy from this is dispersed through the entire national grid. One of the biggest dangers of this is the EMP attack could happen as an example on the east coast and only the east coast would be affected by the E1. The E2 and E3 phase would travel through the national grid, power lines, telephone lines, rail road tracks and other long metal conductors all the way to the west coast and destroy the grid there too. This energy destroys our power system that sends power throughout the country and allows us to have the technical advantages that life gives us. At this point life is for the most part like living in the 1700s again. That is at least for those that don’t use Faraday Bags to protect their electronics from such an event. According to experts as well as the EMP Commission there is a lot of evidence supporting that this can last anywhere from 6 months at it’s shortest to over 10 years! Even 6 months is long enough for an entire country to go to ruin. According to Peter Pry, Chief of Staff of the EMP Commission, said that after 1 year of the EMP event happening that upwards of 90% of the US population could be dead from starvation, disease, dehydration and other problems. That’s A LOT of people. An interesting note is that Coal Fired Power Plants are actually somewhat resilient to EMP attacks because of the older, more simple technology it takes to run them. Generally speaking a Coal Fired power plant has about 6 months worth of coal on hand. So in the best case scenario, certain areas would still have some power, after repairs of course to other infrastructure, for about 6 months. 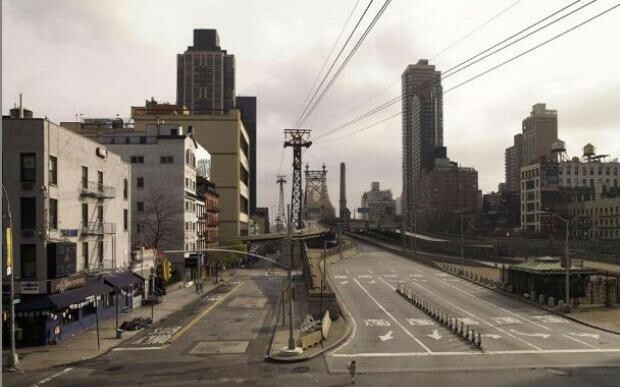 In the end, even with coal fired power plants, the real time frame should be considered no less than 2 years to get to some what “normal” life as far as energy in the power grid goes. The first thing that needs to be done to protect against an EMP is to get specific EMP protection. It’s that simple. The easiest way to protect items from an EMP attack is to put them into a faraday bag and keep them protected from that event. The inevitable question though is: “How will I protect my cell phone if I’m using it throughout the day?” Generally that question can be answered with another question: “What network will a cell phone work on if the power grid is destroyed?” The answer is none. Too often people get focused on cell phones, laptops and TVs because they are the most common used electronics that are used throughout the entire United States. What people too often fail to recognize is that they don’t need to protect their cell phones because there will be very little use for a cell phone after an EMP. There are many other electronics that can be absolutely life changing to have after an EMP. Without question the biggest item needed after an electromagnetic pulse to continue using electronics is a generator. Generators need to be protected within a faraday bag to be usable after an electromagnetic pulse. There many types of generators on the market such as gas, diesel, natural gas, propane, water turbine, air turbine, solar and so on. After years of research a solar generator is by far the best option for long term power outages to run lots of equipment. Solar generators require no maintenance, run for years on end while staying efficient, store energy for years, and has an endless supply of energy to fill them back up. The best solar generator we have found is this one. It also is available in pre-designed kits for different needs so that people can get what best suits them and know that the kit comes complete with every item needed to make it run and charge for years. There are many other items to get to be fully prepared for an EMP attack. There are 12 Key Areas of Preparedness that need to be taken care of before an EMP to be completely safe and prepared for it. Almost every one of the Key Areas of Preparedness will require EMP protection so EMP bags are the first step. It is common knowledge that humans will die after 3 days of no water, so that is the immediate need in preparedness. Getting power after an EMP is all down to each person so power generation such as a solar generator is an absolute must have item. In every long term emergency there is always looting, fighting, stealing, and worse going on, so having firearms, plenty of ammo even more important the training to know how to use them is ideal for preparedness. People need food to continue operating; during emergencies most people expend 3x or more energy than they normally do and consume about 1/2 the calories as they normally do. Medical tools and equipment like first aid kits will be very handy since a little cut that gets sepsis can kill people; but once again medical training will be an absolute must have skill. Shelter is very often passed by as an important prep because most people plan on staying where they are, which is fine, but people don’t know what they don’t know and need to have alternative means of shelter. (As an example, since the E2 phase an EMP can cause fires, the house may burn down and there needs to be another shelter that can be quickly grabbed and taken somewhere else). The #1 killer in emergencies is lack of sanitation; it is important to be able to properly dispose of human waste and stay clean. Being able to communicate within an immediate family and especially a community is ideal, that means HAM radios as well as a like minded group to communicate with. There’s a very good chance that people will need to get to other places for long term emergencies and so transportation is vital to surviving long term. Once the rush of the event has passed on people need forms of enlightenment and entertainment. Having books, movies (solar generator, tv and dvd player) games, activities and so on will be necessary to relieve stress and think clearly as to not make wrong decisions. And of course banking and bartering; any money in a bank account only exists digitally until it is taken out of the bank. Paper money will become quite useless within a few weeks of the EMP attack happening. Also gold and silver will have their place but in the wrong way. As an example, if it costs $18 for 1 troy ounce of silver now, it will be worth 100x after an EMP. However, after an EMP as a society we will no longer use dollars and money to place value. Therefore, an $18 silver coin now may only buy one can of beans later. However, a can of beans now only costs $0.70. So it is wiser to buy the beans and everything else in the Key Areas of Preparedness first, and then get gold and silver. Generally when people finally come to terms with the reality of the situation and what it takes to get prepared they feel frantic and lost. Many people assume that they need to be 100% prepared tomorrow since an EMP bomb could quite literally go off and any time. It is important to take one step at a time, no matter where people are at in their preps they need to consider what they lack, what is most important to get done, and start from there. The first place to start is by getting faraday bags and putting their most vital electronics safely in them. Once that is done, move on to the next preparedness item and keep getting ready!